Mt. Hope Cemetery is located on Weatherford Creek Road in Wayne County, Tennessee. 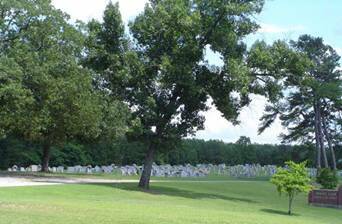 To reach the cemetery from Collinwood, travel south on Tennessee 13 for approximately 4.1 miles. Turn right onto the Natchez Trace access road, then left onto the parkway. Go about 6 miles and turn right (west) onto Weatherford Creek Rd. Travel about 1.1 miles and the cemetery is on the right side of the road. It lies between Mt. Hope Church Rd. and the Mt. Hope Church of Christ just north of the Cypress Inn Fire Department. This enumeration was begun near the northwest corner of the cemetery with Row 1 beginning about 25 yards south of the corner. There are quite a number of old graves in this cemetery dating back to an 1859-death date. Every effort has been made to list the rows in a simple manner for ease in finding graves, but as with many older cemeteries, the graves are sometimes misaligned making it difficult to do so. Melson, Ray; b. 22 Feb 1918, d. 29 Oct 1918, son of P.H. & M.B. Melson, Raymond; b. 07 Sep 1919, d. 22 Oct 1919, son of P.H. & M.B. Moore, Eliza A.; b. 09 Feb 1863, d. 17 Oct 1919, wife of James R.
Morris, Lawton; b. 03 Nov 1916, d. 18 Nov 1934, son of George H. & Mary E.
Morris, infant; b. 14 Jul 1934, d. 14 Jul 1934, daughter of George H. & Mary E.
Morris, Arley; b. 01 May 1932, d. 15 Nov 1932, son of George H. & Mary E.
Morris, Juanita; b. 15 Sep 1918, d. 07 Jul 1920, daughter of George H. & Mary E.
Pigg, Inez M.; b. 27 Aug 1910, d. 14 Aug 1987, wife of Floyd G.
Holt, Ida Belle; b. 08 Nov 1904, d. 14 Sep 1918, daughter of A.A. & M.E. Holt, Ruby Neva; b. 07 Apr 1917, d. 22 Oct 1917, daughter of A.A. & M.E. Hill, Virdie M.; b. 29 Jan 1927, d. 26 Aug 1928, daughter of J.R. & M. B.
Hill, infant; b. 26 Apr 1920, d. 26 Apr 1920, son of J.R. & M.B. Dodd, Willie G.(Holt); b. 14 Nov 1904, d. 27 Feb 1944, wife of Ollie M.
Holt, Warren G.; b. 13 Nov 1920, d. 11 Mar 1986. McFall, Kenneth Ross; b. 27 Nov 1933, d. 07 Sep 1958, TN Pfc. HQ CO 30 Inf. Regt. Hill, M.V. ; b. 28 Jan 1853, d. 04 Sep 1925, wife of A.G.
Holt, Reuben T.; b. 20 Jan 1896, d. 10 Jun 1918, son of F.M. & S.C.
Holt, S.C.; b. 18 Jul 1865, d. 25 Jun 1926, wife of F.M. Holt, F.M. ; b. 16 Oct 1861, d. 28 Jul 1947. Thigpen, Lorene (Gilchrist); b. 01 Jul 1941, 04 May 2009, wife of Amos D.
Holt, infant; b. 20 Oct 1919, d. 20 Oct 1919, son of R.H. & E.M.
Cooper, Pearl B.; b. 28 Aug 1899, d. 20 May 1976, 2nd wife of J.W. Cooper, Ada; b. 08 Jul 1886, d. 06 Oct 1930, 1st wife of J.W. Lawson, Culys V.; b. 23 Oct 1908, d. 05 Dec 1914, son of J.T. & M.E. McFall, A.M. (Dodd); b. 17 Feb 1890, d. 16 Nov 1911, wife of J.D. Holt, Rudolph; b. 02 Feb 1936, d. 17 Oct 1936, son of Arvil & N.M.
Dodd, Gurtru; b. 17 Nov 1900, d. 02 May 1901, daughter of D.D. & M.F. Heard, Ruth; b. 05 Feb 1914, d. 18 Jan 1917, daughter of G. W. & Ella P.
Hayes, Mary L.; b. 11 Jan 1891, d. 11 Jul 1891, daughter of Wallis & Sarah J.
Scott, Mattie G.; b. 23 Jan 1867, d. 09 Jan 1890, 1st wife of D.E. Hayes, Marlin V.; b. 28 Dec 1910, d. 16 Feb 1911, son of R.B. & C.B. Hayes, infant; b. 22 Jun 1918, d. 22 Jun 1918, son of R.B. & C.B. Hayes, Carrie B.; b. 31 Aug 1888, d. 22 Jun 1918, wife of R.B. Johnson, Alpha Birdie (Whitworth); b. 20 Jun 1873, d. 18 Sep 1938, wife of Robert E.
Hayes, Lonnie; b. 10 Oct 1907, d. 30 Apr 1929, son of G.A. & L.J. Hayes, Bessie; b. 25 Jul 1922, d. 09 May 1923, daughter of G.A. & L.J. Hayes, infant; b. 25 Jan 1910, d. 30 Jan 1910, daughter of G.A. & L.J. Hayes, Marvin C.; b. 16 Dec 1905, d. 26 Oct 1906, son of G.A. & L.A.
Moore, Sarah G.; b. 04 Nov 1857, d. 19 Nov 1897, wife of G.W. Holt, Jos; no dates, Cpl. CO. “A” 10th TN Inf. Berry, Jesse; b. 22 Aug 1892, d. 02 Feb 1945, son of Joe & Nellie, TN Pvt. 321 Inf. Hayes, Hiram; b. 20 Dec 1851, d. 23 Jul 1921. Gilchrist, Luther F.; b. 07 Feb 1894, d. 31 Oct 1917, son of Andrew J. & Emma E.
Gilchrist, Emma E.; b. 11 Feb 1918, only date, wife of A.J. Gilchrist, Ada; b. 15 Apr 1896, d. 15 Apr 1898, daughter of Andrew J. & Emma E.
Dodd, A.C.; b. 15 May 1897, d. 28 Aug 1934, TN Pvt. 1 CL 306 Inf. 77 Div. Wright, Floy Mae; b. 04 Mar 1920, d. 04 Aug 2000, wife of Doris F.
Gilchrist, John; b. 10 Mar 1866, d. 11 Oct 1904, son of M.G. & R.C. Gilchrist, William A.; b, 02 Jun 1873, d. 06 Jan 1904, son of M.G. & R.C. Gilchrist, Malcolm; no dates, CO “A” 2 TN Mtd. Inf. Toon, Herman Clyde; b. 22 May, d. 1918, TN Pvt. 156 Depot Brig. Martin, infant; b. 19 Aug 1920, d. 19 Aug 1920, son of J.W. & L.A.
Martin, Martha J.; b. 20 Feb 1872, d. 04 Jun 1917, wife of J.W. Martin, Rosie (Dodd; b. 14 Feb 1895, d. 28 Jan 1918, wife of J.W. McFall, Ollie H.; b. 22 Feb 1908, d. 12 Mar 1991, wife of E. Claude, m: 21 Dec 1927. Weeks, Lillie C.; b. 05 Jan 1904, d. 14 Jun 1943, wife of C.W. Shepard, Clarence Oliver; b. 01 Feb 1902, d. 23 May 1923, son of J.W. & E.L.
Fowler, James H.; b. 17 Oct 1899, d. 17 Feb 1936, TN Pfc. SCV. CO 8th Inf. Shaneyfelt, Christopher A.; b. 03 Feb 1981, d. 03 Feb 1981, son of Connie L.
Burns, Linda A.; b. 18 Feb 1948, wife of Nolan G.
West, Anita (Burns); b. 09 Jul 1944, wife of David H.